Wanting to blaze your own trail of adventure into Zambia? Here is a basic guide for crossing the border if you are doing a self-drive trip with your own vehicle. To enter Zambia, you will need a passport that is valid for a minimum of six-months from the end-date of your intended trip. Need further information on entry requirements? We’ve also got all the information you need to know about getting your visas and vaccinations. 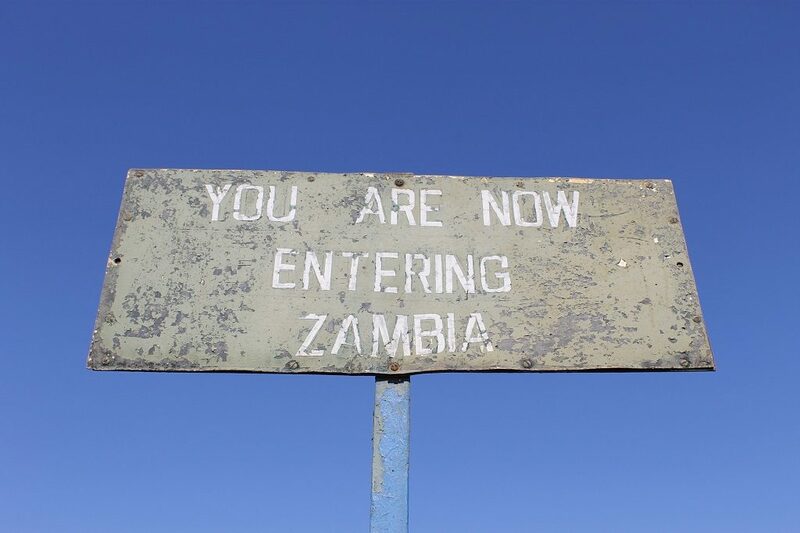 Border posts can be daunting, confusing and may even frustrate you but no worries, you’ll have a good chance of success if you heed the following. Keep everything together. A simple folder for all your important documents will help you not to lose any paperwork. Have all your documents in order ready to hand in to the border official to avoid scrambling and time-wasting. Be patient and smile. This will help make the procedure go smoothly without annoying the person who has the power to give you access. No matter how frustrated you get, try to smile. A positive attitude goes a long way at any border. Ask for the maximum amount of days possible – you could end up stuck in the middle of nowhere with a flat tyre and not be able to return in time. Don’t overstay your visa; this will cause serious problems at the border when trying to leave. Take a pen. Pens are in short supply at most border posts. This will help you fill out the paperwork faster without having to wait. Be friendly, polite and respectful to the border officials. You are a guest in someone else’s country. Remove your caps, hate and sunglasses when talking to them. Don’t be intimidated; stand your ground, if, for example, you are in line and locals push in front of you. Ask them to please respect your place in the line; but don’t become aggressive. With valuables, expensive gear and cash – you’re a great target for crooks. Keep an eye on your stuff. Border crossings can be rife with thieves and pickpockets. Try to leave someone with the vehicle. The driver always has to do most of the paperwork and the passenger only the immigration part, so take it in turns to stay. If you travel alone, trust your gut and move it to a safer locale if you deem it necessary. 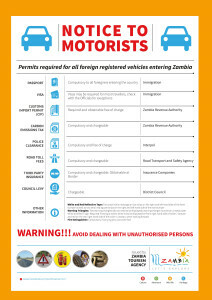 To drive legally in Zambia – you must acquire an International Driving Permit. The IDP is a translation of your national driving license and allows motorists to drive vehicles in foreign countries. Be sure to carry both your IDP and national driving license with you at all times. You will need a police clearance to drive any vehicle across any of our SADC borders. This must be organized in advance of your travels. Take you original vehicle and/or trailer registration papers with you. Certified copies are also acceptable at most border posts. If your vehicle is financed, then the licence papers must be accompanied by a letter from the finance institution, in which they give you authorisation to take the vehicle across the border. If these aren’t the originals, they must be certified by a Commissioner of Oaths. If you’re not the registered owner of the vehicle you’re driving, you must carry an affidavit from the owner giving you authorisation to take the vehicle into Zambia. Again, such an affidavit must be certified by a Commissioner of Oaths. Have your vehicle papers on hand at all times as roadblocks are fairly frequent. If you hire a vehicle you will need additional information which you should receive from your car hire company. *PLEASE NOTE: the information above may be subject to change.